It is recommended to listen to episode 18, Aligning Content With Your Customer Journey, for reference. Different digital media (aka marketing channels) can be used to deliver content to your audience based on their customer journey state. The goal is to personalize content based on the buyer journey’s state. Not all media/channels attract audiences at every state. Banner ads, video ads, paid social media, native ads, email, paid search and organic search can all be aligned to a buyer’s journey state. Targeting methods available to digital media allow marketers to laser-focus their content to the right audience. To utilize that targeting, we must have a segmented database and content specific to a journey state. 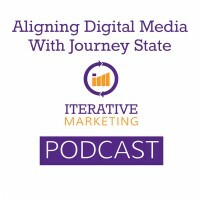 Next week’s episode will explore aligning traditional media with the customer journey state.